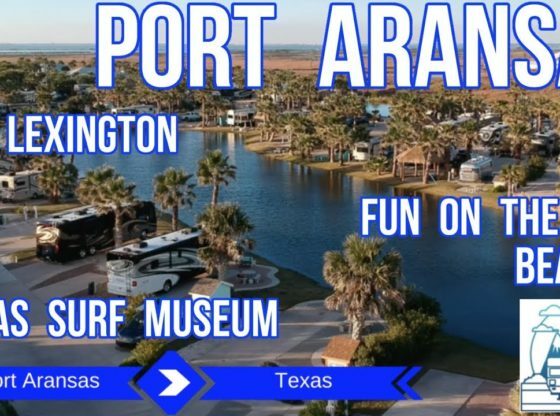 OTPWR Port Aransas – Gulf Waters RV – Corpus Christi – USS Lexington – Full Time RV Family Travel | Corpus Christi Rocks! We’ve finally made it to the Gulf Coast! This week we are in Port Aransas, Texas and loving it. This week’s episode is a little shorter because we finally felt like we had a chance to relax and enjoy the beach. We booked into the wonderful Gulf Waters RV Resort right on the beach on Mustang Island. Our site was the closest one to the private boardwalk that took us over the dunes and onto the beach. Jen and the kids spent a couple days picking up plastics that had washed up onto the beach. They filled 4 plastic grocery bags full and hardly made a dent. We also took some time up in Corpus Christi along the seawall on Ocean Drive. We also visited the USS Lexington aircraft carrier museum and a detour to the Texas Surf Museum. We had a blast in Gulf Waters and it was honestly the first stop that made us a little sad to move on from. Texas Gulf Coast: We’ll be back! We would love to hear from you, so take a minute to let us know what places you think we’d like to see on our journey. Thanks for watching and stay tuned for the next video from Galveston.